Banks are further tightening their lending standards for prime and subprime auto loans. 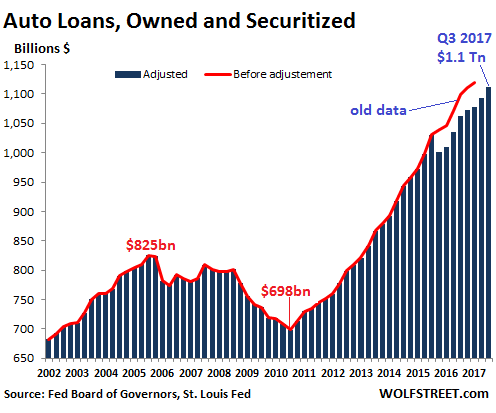 This process started in Q2 2016, when auto lending had reached the apogee of loosey-goosey underwriting that had boosted sales of new and used vehicles to record levels and had ballooned auto loan-balances outstanding to the $1-trillion mark. It also boosted risks for lenders. Inevitably, subprime auto loans started running into trouble in 2016, and it was time to not throw the last trace of prudence into the wind entirely. During Q3 2017, 10% of the banks tightened underwriting conditions, compared to the prior quarter, but 0% loosened underwriting conditions. In other words, the tightening is proceeding gradually, on a bank-by-bank basis, and the easing has stopped entirely. 7% net tightened conditions on minimum required down payments. Less favorable or more uncertain economic outlook: 50% somewhat important; 30% very important. Deterioration or expected deterioration in the quality of your bank’s existing loan portfolio: 30% somewhat important; 40% very important. Reduced tolerance for risk: 30% somewhat important; 50% very important. Less favorable or more uncertain expectations regarding collateral values [used vehicle values]: 40% somewhat important; 40% very important. Lower or more uncertain resale value for these loans in the secondary market: 33% very important; 0% somewhat important. Some of this tightening is already showing up in the data. 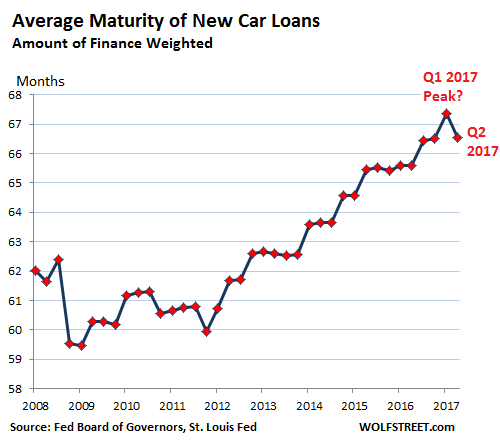 For example, the average maturity of new-vehicle loans peaked in Q1 2017 at 67.4 months, according to Federal Reserve data. The data for Q3 is not yet available, but by Q2 the average maturity dropped to 66.5 months, the first major drop since 2011. But the tightening hasn’t yet shown up in total auto loan balances outstanding, which jumped by $19 billion during the third quarter, likely boosted by the first batch of replacement sales from the hurricanes. Adjustment of data happens all the time. These are estimates that can be off, and occasionally, adjustments are made to try to put them back on track. 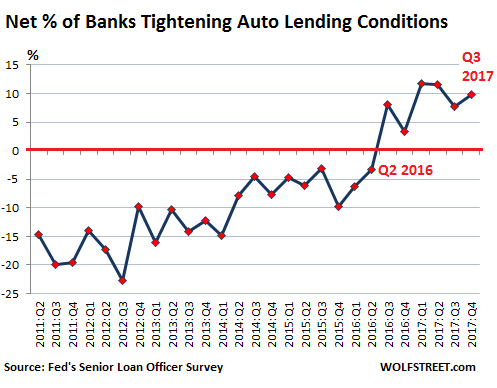 But it does show that auto loans did not suddenly plunge in Q4 2015, as the chart based on the blue columns alone would have otherwise indicated. That banks are tightening their auto-lending standards ever so gradually is another headwind the auto industry is facing. The hurricanes, by destroying or damaging a few hundred thousand vehicles, created some temporary replacement demand for new and used vehicles, some of it financed by insurance companies. And incomes that have been stagnating for a large part of the population. And these headwinds will still be there after the replacement demand from the hurricanes settles down.